Technoplogy and Machinery sector is on a roll as new innovations and investments in research and development is set to drive the new age demand. It is time that artificial Intelligence will take on the entire process and operational sector within the jewellery manufacturing segment. 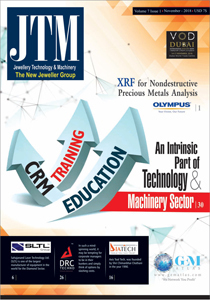 As we dwell on the subject of State of the art cutting edge tech tools, AI, R&D, it is but important to scrutinise the tech and machine tool Industry in terms of Post sale activities. Are we prepared for the super effective "after sales service" that is demanded by the customer, are we ready for the "effective customer support functions" expected by every customer? These are some of the many questions answered by JTM bureau in this special report. Our bureau has developed an important story on "Customer service" and "after sale support" that is the need of the hour. The team has interviewed many a stalwarts of the Industry to understand the importance and challenges faced by the suppliers towards their respective customers when it comes to post sale activities. An interesting read. Customer service has always driven the producers to achieve optimum quality and efficiency. But with competition brewing between multinational principals and regional tech producers, it is only time that the country will witness 24X7 support services with zero downtime. A dream destination that is perfectly achievable.